There’s no doubt it’s a long way to Hawaii, but that only adds to the excitement of these incredible islands in the middle of the Pacific Ocean. The best way to deal with the length of journey is to stop over for a few days to enjoy the sights of Los Angeles. Either stay on the beach in Santa Monica or soak up the sights and sounds of the city, staying in Hollywood or Beverly Hills. Now that you’re in full swing of enjoying your holiday, take the five hour flight over to Honolulu on the island of Oahu. Waikiki Beach is a fabulous mix of sand & surf, cocktails & restaurants, boutiques & malls. There’s a great choice of hotels, so we can choose one that’s perfect for you. Our suggestion is three nights in Los Angeles followed by seven nights in Hawaii, but we can extend this as you wish. And you might want to visit another Hawaiian Island. Kauai is a stunning paradise of sandy beaches and breathtaking scenery. Hawaii Island (also known as Big Island) is an incredible place of immense volcanoes and rainforests. And Maui offers a great combination of beaches and volcanoes. Fly to Los Angeles and transfer independently to your hotel. We suggest the Kimpton Everly Hotel, close to Hollywood Boulevard. It is a cool oasis in this city, featuring a roof top pool and a daily wine hour in the lobby. Time to experience Los Angeles. Perhaps go on a tour of Hollywood and homes of the stars. You can explore LA on a guided bike ride. Or how about a Foodie Tour? We’ll be happy to book these experiences for you. 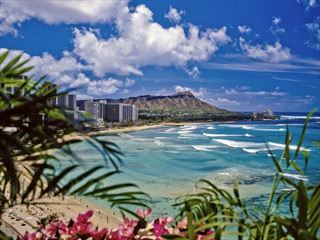 Head to LAX and board your flight to Honolulu International Airport. It’s just a short distance to Waikiki Beach and here you can choose from a wide variety of hotels. Our choice is the Pacific Beach Hotel, but if you want a luxurious stay then either opt for the Moana Surfrider or the historic Royal Hawaiian Hotel. Soak up the atmosphere of this fun island in the middle of the Pacific. Sip a Mai Tai cocktail whilst watching the surfers (we recommend the ones at the Moana Surfrider beachbar). Stroll iconic Waikiki Beach. Choose a different restaurant every night to sample a mix of seafood, Hawaiian, Asian and American food. Browse the myriad shops, from souvenir stands to massive malls. You could also book a Big Island day trip including a visit to the amazing Volcano National Park, home to the mighty Kilauea Volcano. Time to fly home. Or you could split the journey with a flutter in the casinos of Las Vegas or to do a spot of sightseeing in New York. Daily flights available with United Airlines, Aer Lingus, KLM, Delta Airlines, American Airlines, British Airways, Virgin Atlantic and US Airways. Close to Hollywood Boulevard and the iconic Capitol Records Building, this is a comfortable hotel with a modern vibe. With an outdoor pool, cool cocktail bar, all-day restaurant and daily hosted wine hour, this is a great base for an LA stay. The Alohilani Resort (formerly The Pacific Beach Hotel) has undergone extensive renovations. 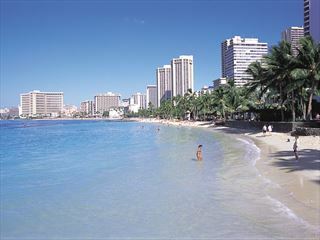 It is located directly across from Waikiki Beach Oahu, central to a wide array of shops, restaurants and bars. A modern high-rise hotel, the upper floors offer fabulous view of the bay, and all bedrooms have a balcony. Your stay and cruise starts with the excitement of Las Vegas followed by flight to Honolulu in Hawaii, home of the world famous Waikiki Beach. Spend 3 nights here relaxing and exploring this beautiful island before setting sail on your 7 night Hawaiian cruise. Explore Hawaii at your own pace, starting at Waikiki Beach on Oahu, hopping over to volcanic Big Island, then relaxing on beautiful Maui before finishing up on the stunning island of Kauai. This suggested itinerary is 10 days but we can tailor-make your holiday just for you. Located on the north coast of Ohau, with fabulous beaches, an array of thrilling water sports, delicious Hawaiian cuisine, natural spa treatments, beach vibe decor, tranquil island ambience - Turtle Bay Resort in Oahu has it all. A new hotel on the LA scene, located close to Hollywood Boulevard and the iconic Capitol Records Building. A cool, modern oasis in this buzzing city, you can retreat to your calm, comfortable room to re-charge you batteries. 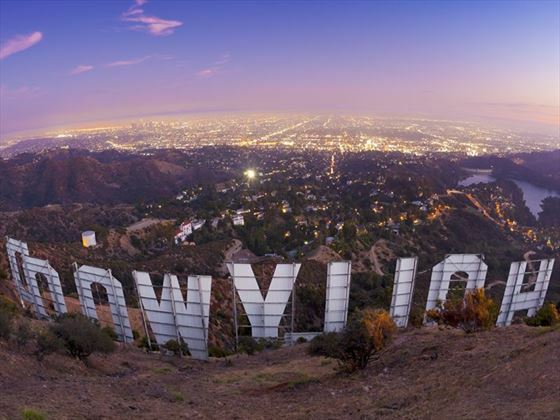 And perhaps you choose a guestroom with direct views of the Hollywood sign, to make the most of your stay in LA. There is an outdoor pool on the fifth floor, where you can enjoy a cool cocktail, or dress to impress for cocktails in the Ever Bar. There is handy all-day dining restaurant in the hotel – the Jane Q, with an imaginative, locally sourced menu. Perhaps you’ll want to take advantage of the complimentary PUBLIC bikes to cycle the neighbourhood. And as it’s a Kimpton hotel, you can enjoy a daily hosted wine hour every evening, to get you in the mood for a night in this vibrant city. Formerly the Pacific Beach Hotel, Alohilani Resort is in a wonderful location, right in the middle of Waikiki on Oahu island. An oasis of tranquility, contemporary style and beautiful vistas, this amazing resort transports you into the heart of Hawaii's desirable beachside lifestyle. With its calming neutral pallette, luxurious indoor and outdoor spaces, and incredible expansive rooms and suites with floor-to-ceiling windows and private lanais, Alohilani Resort feels wonderfully indulgent, the perfect retreat for a romantic honeymoon. After relaxing by the modern pool or exploring popular Waikiki Beach, there's a fantastic selection of restaurants here for you to sink your teeth into. Head to Morimoto for a cool taste of authentic Asian cuisine, before venturing to sophisticated Swell Bar for a great cocktail and live, local music.